Starting and building my own law firm was very difficult in the early years. But I kept at it. I bought and read (and recommend that you read) E-Myth Revisited, E-Myth Mastery and Awaken the Entrepreneur Within. I began to look outside of the legal world to see what other successful enterprises were doing to build their “enterprises” and I began importing Gerber’s ideas about “The Discipline of the Enterprise Leader” and the “Discipline of the Financial Leader” and of the “Management Leader” into my practice in Fairfax, Virginia: BenGlassLaw. Early on, though I discovered that it didn’t matter much if you were good at being “the leader” if there weren’t any clients coming through the door. You see, I could learn how to run a world class enterprise but that enterprise still needed clients for whom world class results and service could be provided. And my practice grew even more. 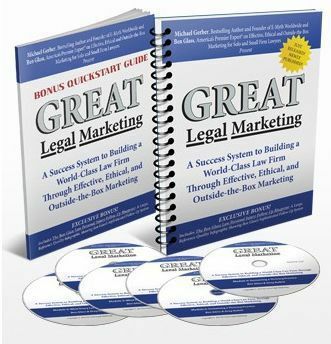 So, when I got the chance to team up with Michael Gerber to create a product for lawyers that would look specifically at how you can apply his models of entrepreneurial success to the specific areas of lead generation and marketing (which have been the big leverage points for my marketing and for which I am an expert), I leapt at the chance. It was a way to say “thanks” to Michael for all that he had taught me.